Whether it's fishing for salmon on Lake Michigan, or catching your limit on Ludington's Pere Marquette Lake--we've got the best variety of fishing here in Ludington. 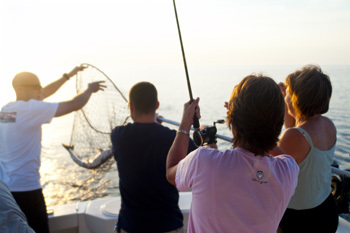 Some of the best charter captains on Lake Michigan make Ludington their home port, and will happily take people out on the lake to fish for salmon and trout. Anglers also love fishing in Ludington during the winter. Had good yellow perch fishing. Most were using minnows or wax worms. The ramp has one dock in, but the fish cleaning station is still closed. Ice on the pier has limited access and anglers need to use caution. Brown trout were caught on spawn. Those trolling the shoreline with spoons and body baits caught brown trout in six to 12 feet. Pere Marquette Lake: Boat anglers were catching yellow perch.